On a recent Sunday in the Redux parking lot, Charles Williams noticed a woman doing something unusual next to Patch Whisky’s new mural. She was doubled over backwards serenely. Yoga has become commonplace in the American landscape, but when it is performed in unexpected arenas, people take notice. As we sipped our coffee on the sunny balcony of Brown’s Court Bakery, Woods explained the many ways backbends stimulate better health and posture; although it feels wonderful to bend forwards when you are experiencing back pain, only a proper backbend can help to realign the spine. We spend so many hours of every day hunched over screens and steering wheels- backbends can free up the shoulders and the front of the body. This isn’t to say that they’re easy; she’s the first to admit that sometimes the work has been hard. For her portraits, Wood splays back into full wheel, a dramatic pose which is one of the most vulnerable in yoga. She shoots early, before the crowds, sometimes on sites which are unstable or rocky. When she finds herself becoming tense or shaky, she meditates on a favorite sutra: Steadiness, Ease, Asana. It’s applicable to everything, really. Steady your gaze in order to steady your mind. Steady your mind, and you still your body. Steel your resolve. Then trust yourself; float up. Suddenly, there you are, just about where you ought to be. While Wood’s Instagram challenge has led to breakthroughs in her personal practice, it’s also a warm up for the hard work of running a nonprofit. 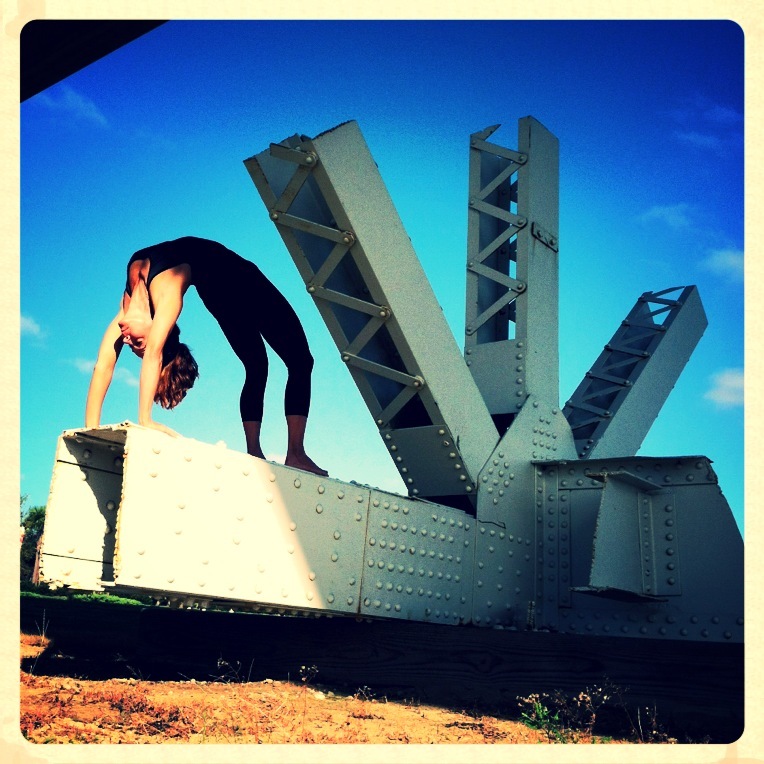 She ruptured a disk five years ago, and used yoga- carefully- to help herself heal. She’s delighted at the prospect of helping others to work through their pain; and a little gleeful to have found a way to utilize what sometimes amounts to rubbernecking. “Nobody can walk away from contortionism!” she said. We’re pleased to be a part of the circus. You can follow her adventures on Instagram or on her blog. 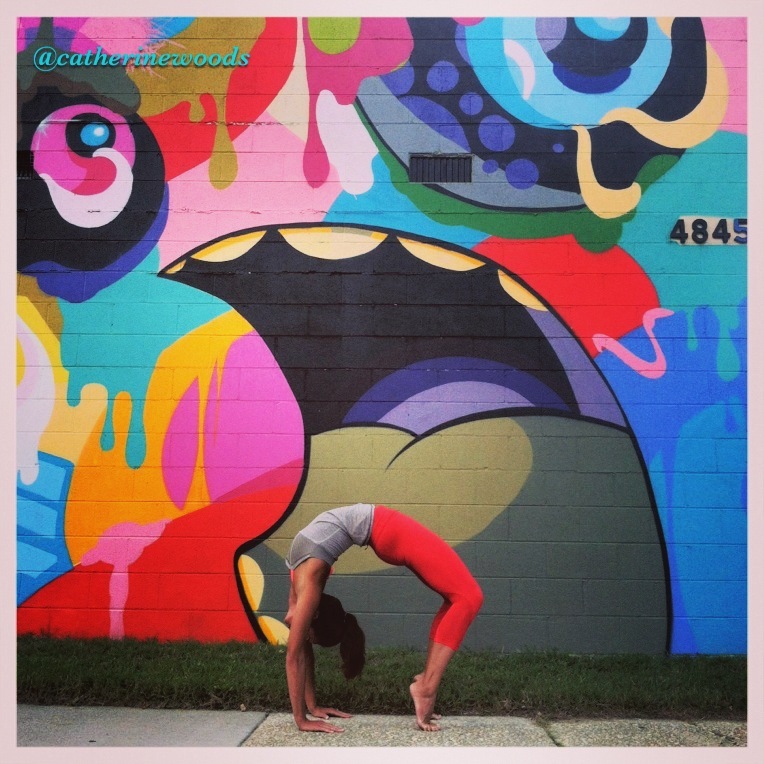 She also teaches yoga at Blue Turtle Fitness; stop by and say hello. Float up, float on. Keep smiling, Cathy. This entry was posted in Exhibitions, Pauline West and tagged Cathy Woods, Charles Williams, Living Art in Public Places, Patch Whisky, Pauline West, Yoga. Bookmark the permalink.